Kindness includes actively building positive experiences into the relationship. People with strong relationships have learned that it is important to continue building the relationship over the years. I don’t know about you, but I love seeing my wife’s face light up when I’ve done something sweet for her. Here is a list to give you some ideas and tips to add acts of kindness to your day for your wife. 1) Do something the night before – pack her lunch or make sure her work clothes are ready to go, that will allow her to sleep in an extra 10 or 15 minutes. 2) Bring her breakfast in bed. 3) Start her morning coffee while she’s in theshower. 4) Put her towel in the dryer or in front of a heater while she showers. 5) Don’t look at a phone, TV, or computer while sharing a meal with her. Give your wife your undivided attention. 6) Fix her favorite meal – even if you don’t particularly like it. 7) Pick up her favorite drink and have it waiting for her in the fridge. 8) Fill the gas tank. 9) Wash that one item she uses frequently but rarely washes (a favorite sweater, a coffee mug, water bottle, or even her car). 10) Leave a lipstick or mirror fog message on the bathroom mirror, just to let her know you love her. 11) Send her a sweet flirty text during the day. 13) Make a date to do her hobby together. 14) Hold her hand when you’re in a car together. 15) Kiss her passionately, just because. 16) Give her a surprise massage. 17) Give her a sincere and completely unexpected compliment. 18) Call her just to let her know that you love her and that you’re thinking about her. 19) Tell her how much you appreciate her. 20) Tell her that you’re glad you married her. 21) Ask her what you can do for her. 22) Start a conversation with her that matters. 23) When you can’t agree on something, let her win. 24) Slip a love note in her lunch, pocket, wallet, or car. 25) Order something simple online that you know she’ll love. Everyone loves getting surprises in the mail! 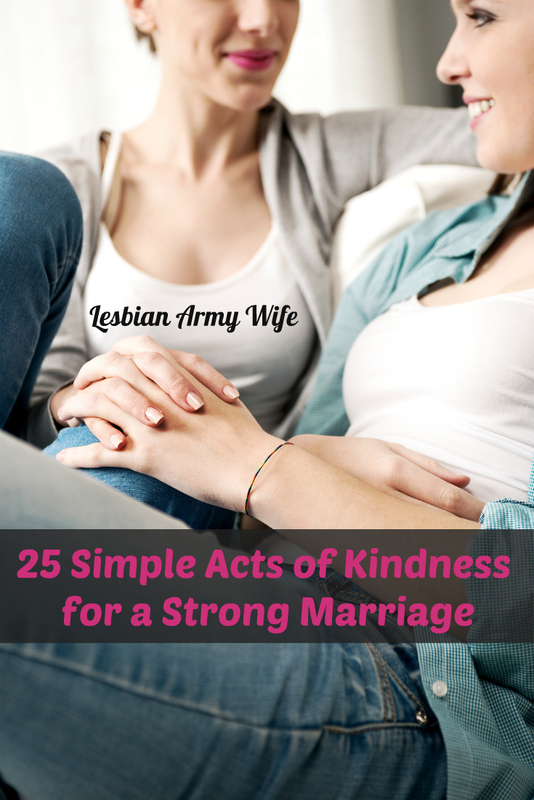 Showing kindness to your spouse is fundamental to marriage. Kindness is contagious. Being kind to your spouse creates goodwill and cooperation. When you are kind, your partner is far more likely to be kind to you. Kindness ensures peace in the home. Emotional closeness, appreciation, and love will grow stronger and stronger with each act of kindness you and your spouse show each other. What acts of kindness do you do for you wife? Leave a comment.